Space 6x12 m, floor covered with white gravel, L-form podium of wooden boards, 14 monitors of different sizes dug into the gravel, a rake, 3 video tapes (color, sound). The floor of a room 6 x 12 m in size is covered in white pebbles. Fourteen monitors are sunk into the raked surface, each in a different position. Some jut out vertically like stone blocks, some seem to be sinking into quicksand and some are hardly visible above the surface. 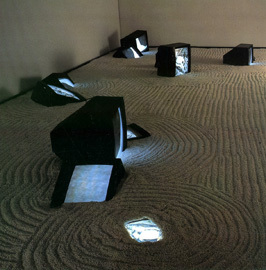 Their number and arrangement coincide with the arrangement of rocks in the Zen garden of the Ryoanji Temple in Kyoto. The monitor screens show video footage of a) a black rock in the snow, b) rapids in a little forest brook, c) swift motion through a forest. An L-shaped boardwalk is placed around the pebble-covered section so that the viewers can stand on it or walk. It is impossible to see all fourteen monitors at once from any position on the boardwalk.